Really interesting gig this week. Steven Wright and I are working together here in Vancouver at an international conference on restorative practices, the kinds of things that people do to bring relationship and community to the justice, education and community systems that more often than not drive us apart. There are some real heros here and leaders in the field including Howard Zehr, one of the founders of the restorative justice movement, and many leading practitioners from around the world. The conference itself is a pretty standard set up with plenary discussions dotting a schedule of concurrent sessions. Steven and I are putting into practice an idea that a number of us have been playing with for a could of years, namely hosting a reflective conversation space in which the conference participants can help create the harvest and meaning making about the whole event. We have a little conversation space set up in the foyer of the hotel, with table tops covered with flipchart paper on which we are writing questions for reflection. All of the insight is being harvested every day on two large murals that Steven is creating, based on a three panel image of a river emerging from the headwaters, travelling through fertile lands and emptying into the ocean. This metaphor is charting the learning journey of the 280 people here. Yesterday we were interested in the questions that were coming up, the droplets of water and insight that lie in the multiple headwaters of our mainstream of restorative practices. Our question for our space was “What are the questions you are hearing today?” From that question we harvest three main tributaries that flow into our mainstream: people are curious about conceptual questions (What are the values and deep practices of restorative community? 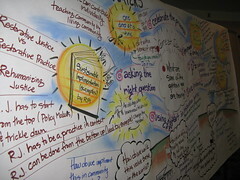 ), contextual questions (How do we do this in education/community/social services?) and individual practice questions (Where do I start? What are the essential capacities?). At the end of each day, Steven, Howard and I have been reporting what we have been hearing and seeing back to the whole. Today our river is moving into the rich plains and fields of established practice and we are asking the question “What patterns give life to restorative practice?” Already people are engaged in questions of process, listening, showing up, facilitating and working that are suggesting a pattern language of restorative practice. That is our goal for today – to surface that learning for the community. Tomorrow we are looking at the ocean of possibility and the new ground that is created as we extend these practices into new places. This is not a standard conference facilitation job for sure. Rather we are inviting people into a deeper reflective space, harvesting collective meaning and learning and giving a context for a shared learning journey. Lots to come.